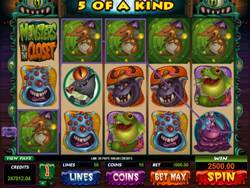 Slot Games listed are Mermaids Millions, Muchos Grande Slot, Mermaid Queen, Mister Money and Monsters in the Closet Slot. 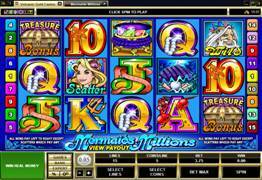 Mermaids Millions is a microgaming bonus feature slot with 2 bonus features. 3 Scattered mermaids will trigger 10 free spins at a 3x multiplier. 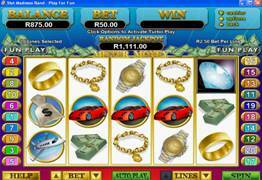 These free spins can be triggered again and again during the feature. The Treasure Bonus feature is triggered when 3 or more Treasure Bonus icons appear on a payline. You then get to open treasure boxes for cash amounts hidden inside each box. 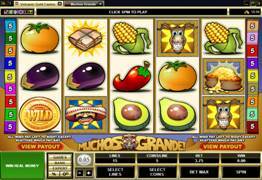 Muchos Grande has a Treasure theme - You can bet up to 5 coins on each of the 15 paylines, taking the maximum wager per spin to 75 coins. The Rattler symbol is the scatter symbol and the Gold Coin is the Wild Symbol which substitutes for all symbols except the scatter and bonus trigger. Get the Map Bonus in oreder to hunt around for the hidden missing treasure. 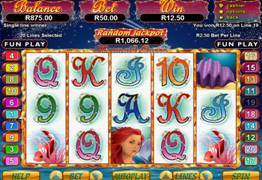 Mermaid Queen is an RTG Slot with a Neptune under the sea theme. The Free games feature is triggered when a mermaid appears on reels 1, 3 and 5 at the same time. 10 free games will be given at 2x multiplier. Every time a purple clam appears on the screen - an additional free game will be added. The free spins can go on for ages, because during some spins 3 to 4 clams can appear at the same time. All the extra spins awarded due to clams landing will also be spun at 3x multiplier. Mister Money is an RTG slot which gets the player to rub noses with the ultra rich! Diamonds are the order of the day and when 3 of the red diamonds land on a payline - you get to choose moneybags, and behind each money bag is either a free spin or a multiplier. White diamonds are wild. The famous RTG random progressive jackpot can also go off at any time whilst you are playing Mister Money Slot. This new game from Microgaming is great fun and has weird and unimaginable monsters lurking in the closet. The coin betting range is between $0.01 to $0.20 on 5 reels and 50 pay lines making a possible maximum bet of $100.so the game caters for the careful player to the adventurous one! There are Wild and Scatter symbols as well as Bonus Features so there are plenty of opportunities to score. The Monster in the Closet is the Wild and trigger 5 wilds and the jackpot of 6000 coins is yours. The Bull is the Scatter symbol and 3 or more will get you 12 free spins with all wins multiplied 3x. The bonus symbol is the Skeleton Key and 3 or more will activate the special Bonus Round. In the Monster Closet Bonus Round you can select from any of 5 closet doors, in each closet there lurks a monster with a specific payout. There are even special bonuses within the bonus round – scary but play it and see how you go – it can be very rewarding! All Star Slots is one of our favorite RTG Casinos. They offer the full suite of RTG slots including Mermaid Queen, Mister Money Slot, Tritons Treasure, Aztec Feature Guarantee and many more. New players can get up to $787.00 worth of free bonuses. Players from the USA are accepted too.